Since the start of my interest in chameleons the choices of chameleon books that deal with them have grown through the years to include an interesting array of titles. Some of them ended up being better than others and some being downright disappointing. The latest entry in this compendium of books on chameleons enters in on this list as a useful addition to the chameleon owner's library. A Field Guide to the Reptiles of East Africa is a very informative and useful book for anyone interested in any of the reptiles of this geographic area of Africa. 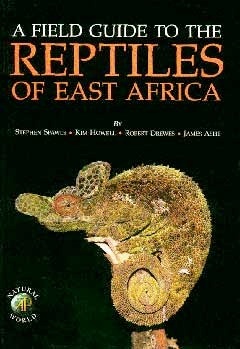 It includes information on the reptile populations from the countries of Tanzania, Kenya, Uganda, Rwanda and Burundi but it also includes the related distributions in Angola, Burundi, the Democratic Republic of the Congo, Equatorial Guinea, Liberia, Malawi, Mozambique, Somalia, Sudan and Zambia. It is really a lot of territory to attempt to cover in one book! But the authors do so in a concise and reasonable manner. The books format is set up into four basic areas: Contents, Introductory Essays, Species Accounts and Appendices, including some 500 color photographs. There are 33 Chameleon and 7 Rhampholeon species represented which also include identification keys as a bonus additional tool. I have to say the most appealing part of this book was being able to see color photos of several species of chameleons that I had only know by written accounts or from line drawings or black and white prints in Les Cameleons de Afrique Central by Gaston-Francois de Witte and other similar literature. While the pictures are fairly small they do an excellent job in representing some previously little known chameleons. I was so pleased to see the adult coloration of a male Chamaeleo carpenteri with its blues, greens, yellows and oranges or the amazing dorsal crest and scalation (and coloration) of Chamaeleo laterispinis, very nice! The individual species accounts are concise and include a distribution map, a basic identification/description, habitat and distribution information as well as natural history information that makes reference to strata and type of vegetation the species is found to habituate, the mode of reproduction and sometimes it even includes the food types preferred. While the information is at times cryptic and some of the more commonly held species are lacking in known detail, there is helpful information to be found on many species that have, to this point have been given little or only elusive accounts. Another helpful part of this book is the references to habitat types and even includes some basic photographs of the habitats. I have always tried to use the natural habitats as a basic starting reference to setting up my captive husbandry parameters, so the inclusion of this type is always a welcome addition in assisting me in my attempts to provide the most accurate kind of caging environments for my chameleons. Overall, I think that this book should have a well-found place on the bookshelves of any devoted chamaelophile as it has much to offer in its scope and content. I would place it on the higher end of my list of chameleon reference books to own. For those of you that are interested in purchasing this book it is available through Amazon.com at a 30% reduced price!